Harbinger Integrated Hybrid Automation Framework (HIHAF) is a codeless automated testing solution that is highly suitable for manual testers, business analysts, and non-technical users to test applications quickly. HIHAF offers an easy and affordable automation solution that does not require any coding knowledge. It has support for web (desktop / mobile), mobile apps (Android and iOS), cloud / hosted database, and API testing. Furthermore, it integrates with DevOps tools like Jenkins, and Bamboo and conforms to changing integration requirements in the market. HIHAF has been successfully used to automate complex HR workflows that include recruitment, onboarding, payroll, and benefits, and is highly suitable for cloud / hybrid application deployments. Software and application testing is considered to be critical for any idea that gets converted into a new product or application. It is one such process that validates the functionality for which it is designed. With changes in existing functionality, and new functionalities in current systems, manual testing has become very exhaustive, and time consuming resulting in higher cost of quality. 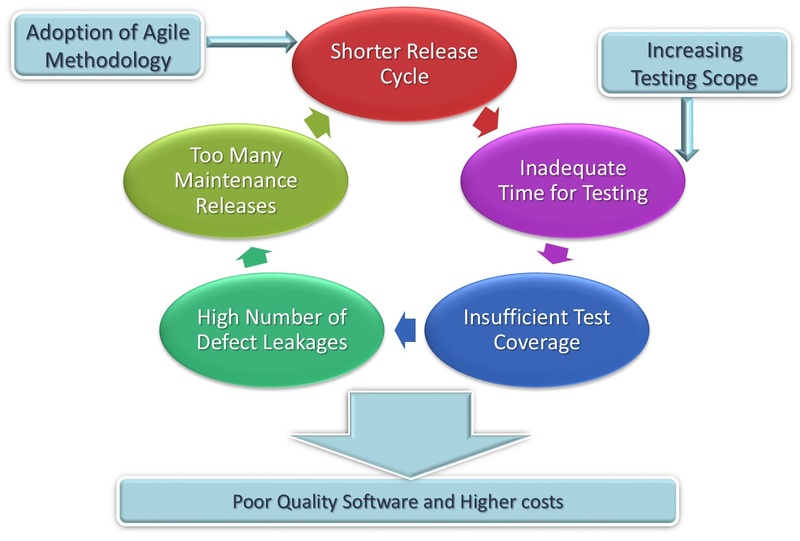 To address these challenges, automation is a must in software testing. The solution to above challenges lies in automating the testing process. There are many tools and frameworks to automate the test cases, but there are certain challenges with automation tools that are currently available in the market. Requirement of skilled people with programming knowledge like JAVA, C# etc., has been a big barrier for many organizations and it also adds to the high maintenance and support costs. Additionally, with the iterative model of development in agile world, and requirements not being static, like in the case of the waterfall model, automation tools that are not revamped to support newer models pose serious limitations. Furthermore, for enterprise applications, web-services, APIs and integrations play a critical role in the industry, and one must use different tools for automating integration tests and API tests. Based on our experience with HR applications, there is enormous amount of data from various combinations and customizations, in recruitment, onboarding, payroll, time and attendance, benefits, rewards, etc., and it is quite time consuming and tedious. Manually testing of these scenarios is next to impossible. Fortunately, we have a solution for you to overcome these challenges. HIHAF is built on Selenium based Framework. It integrates Selenium libraries for Web applications, Auto IT libraries for Windows, and CLI applications and Appium for communicating with mobile apps. It provides benefits of keyword driven frameworks, and also data driven frameworks. Since programming and associated talent remains one of the biggest challenges for Automation Testing, codeless automation is industry’s need. With the use of HIHAF, automation can be achieved without any programming knowledge or skills. Being keyword driven, testers can use these keywords and associated data that could be used to automate the manual user actions. Being data driven allows automation of multiple data combinations and customization. This non-dependency on programming reduces automation script development time by 40%. Based on the experience, Harbinger’s HIHAF tool helps achieving 80-85% of project automation, and saves 75% maintenance efforts over traditional way of implementing automation. Continuous integration – Supports continuous integration tools like Jenkins, Bamboo, etc. HIHAF has no coding dependency and uses Hybrid (Data driven and Keyword driven) approach. Once the framework is set in the initial stage, the manual testers with no coding background can use HIHAF for automating test cases. Test scripts are written in plain English, so anyone can use this framework to automate application. HIHAF offers more value as compared to other automation solution providers. One does not need to make changes in multiple scripts due to change in requirements. Minor changes in the object properties are sufficient enough to have the script updated. This leads to less script maintenance, and also helps in keeping up with the requirements. Same set of test scripts can be executed on any browsers like IE, FF, Chrome, Safari, and any operating systems like Windows, Mac, and Linux. In addition to that same scripts can be re-used for iOS and Android with minimal change. This functionality presents significant savings both in terms of dollar amount saved, and time it takes to write scripts for all platforms. Reports, an outcome of script execution is an important module in automation. HIHAF provides three tier Hierarchical HTML reports like summary, detailed reports, and screenshots. Summary gives information about high level information like how many test cases passed, and how many failed. In detailed reports, status of each step is provided along with the reason for failure. For any failed step, automatic screenshot is taken to analyze it.